Whiplash occurs when a person’s head moves backward and then forward suddenly with great force. This injury is most common following a rear-end car collision. It can also result from physical abuse, sports injuries, or amusement park rides.Whiplash results when the soft tissues (the muscles and ligaments) of your neck extend beyond their typical range of motion. Your symptoms might not appear for a while, so it’s important to pay attention to any physical changes for a few days following any accident.Whiplash is thought of as a relatively mild condition, but it can cause long-term pain and discomfort. Cervical spondylosis is a common, age-related condition that affects the joints and discs in your cervical spine, which is in your neck. It’s also known as cervical osteoarthritis or neck arthritis. It develops from wear and tear of cartilage and bones. While it’s largely due to age, it can be caused by other factors as well. Sprains occur when a joint is twisted while bearing some weight. Many people are familiar with rolling, twisting, or spraining an ankle. This is often caused by stepping or falling off of a higher platform, like a sidewalk. Sprains are usually noticeable when they occur. But sometimes a minor sprain will happen without your noticing. The primary symptoms of sprains include limited mobility, inflammation, pain, swelling, and bruising. You might hear a popping noise at the time of injury.Strains are often accompanied by pain, cramping, swelling, muscle spasms, and stiffness or soreness in the muscle. As with sprains, you may be aware of the exact movement or activity that created the strain, or you may notice symptoms only later. 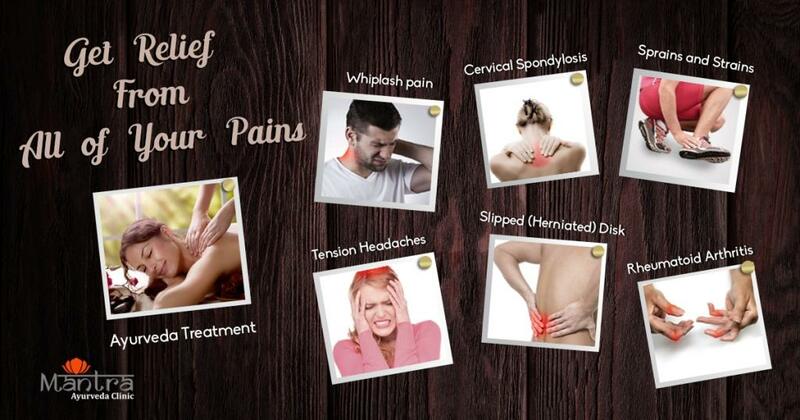 A tension headache is the most common type of headache. It can cause mild, moderate, or intense pain in your head, neck, and behind your eyes. Some patients say that a tension headache feels like a tight band around their forehead. Ayurveda & Keraliya Panchakarma Therapies for a period of 7/14/21/28 days according to the severity of the disease which includes,Shiro dhara(pouring continuous stream of medicated oil, buttermilk etc on the fore head and doing a gentle & soothing head massage), Shiro vasti(A special technique of bathing the head in medicated oils using a special cap like apparatus), Abhyangam( A whole body massage with specific herbal oils, achieves deepest healing effects by naturally harmonizing Body, Mind, Soul and the Senses, Nadi Swedam(medicated steam bath), Nasyam(administration of medicated oil through the nose, cleanses accumulated Kapha toxins from the head and neck region),, Shastika Sali Pinda Swedam/ Navarakizhi (A highly effective rejuvenation technique using a special type of rice that is cooked, tied into boluses and dipped into an herbal decoction and warm milk, then skillfully massaged all over the body), Pizhichil (medicated oil bath), Greeva vasthi (a treatment done on to the neck to decrease cervical spinal compression). Pichu can be performed on the head, neck, spine, and shoulders as per the state of illness, and is highly beneficial for ailments affecting the head, spine and diseases of cranial nerves caused by vata disorder. Lepam( application of herbal paste externally over the affected area, highly beneficial for arthritis/inflammation with swelling and pain,injuries.